This session, recorded in a superb midtown studio in New York during September 1995, shows the David S. Ware Quartet at the height of its powers. This is one of the foremost groups playing today and their performance here is captured by engineer Nick Prout with extraordinary clarity. 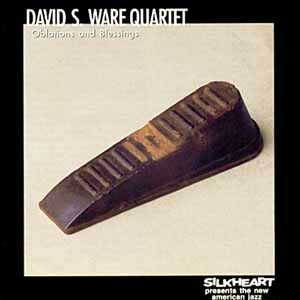 The development of David S. Ware's music is one of the more significant histories in today's jazz and earlier examples from the Silkheart catalogue are 113, 127, and 128. To say that David Spencer Ware is an enigma is to say that the 46-year old tenor saxophonist has been blessed. Nowadays the quest to create anything that seems in any way out of step with what generally passes for creative expression is an exceedingly uncomfortable enterprise. Especially when one considers the many mundane matters that converge on an artist in order to thwart such pursuits. But those of us who think art should bridge the widening gap between the uplifting and the uninspired need only listen to Ware and his mordacious quartet for an idea what music can become when it is perceived as - to borrow a phrase an open sky. That the tenorman has been able to both retain his vision in the current climate and translate it into statements that capture the hearts and minds of attentive listeners everywhere is indeed evidence that he possesses a rare spiritual endowment, an enviable state of autonomy and grace. The beauty of the album before you, in both title as well as its marvelous transformations of chords and other long- familiar jazz components into something far outside the parameters usually set for them, suggests that Ware does not take his blessings lightly. Although I was not familiar with the term "oblation" before encountering it on the label of the advance tape, once I found its meaning, everything made sense. As defined by Webster's New Twentieth Century Dictionary, an oblation is "the act of offering something as worship or thanksgiving", an idea that could easily explain Ware's reasons for sharing his obvious talent. Is it any wonder that the title track, a dense, hardblowing excursion that over the course of seventeen minutes displays much of the sonic whimsy this group is known for, is the longest piece on the album? Ware, responding to a question I once asked him about John Coltrane, said that it was Trane "who crystallized (for him) the idea of music as a vehicle for transcendence." If nothing else, Oblations And Blessings finds Ware making the most of that hard-won revelation. Of course, he has help. This is the fifth outing for which Ware has gathered the rhythm section that many think is the most dynamic in all of jazz right now. Here, it's easy to understand where all the admiration comes from. Just listen. Listen as the quartet comes out full bore and then breaks itself down into any number of subsets - tenor bass/drums, solo bass, piano bass, solo drums - without ever altering the music's insistence. Listen to the way "Of Shambhala" defines a new concept of space for the ensemble, with everyone dropping meticulous accents around Ware's impassioned ruminations. Listen to how the contributions of pianist Matthew Shipp and bassist William Parker defy the roles their instruments usually play in a chamber jazz quartet: Parker by inhabiting the foreground without clashing with the leader, and Shipp by merely building a context for the keys in a setting where a chordal instrument was once considered a liability. And finally, listen to how drummer Whit Dickey becomes the foundation, reaffirming the life force of an art music that is steeped in the blues, providing what Thelonious Monk must have meant when he came up with the term "rhythm-a-ning". Enjoy.